While on a gorilla tracking safari a tourist has to put on dull colors that are not shouting to scare the gorillas away. Tourists should put on long sleeved shirts so to be safe from the scratches of the trees in the forests as you are tracking gorillas. This will help you be safe and keep your skin health. Tourists on gorilla safaris should wear long trousers and jeans which will also keep them safe from the scratches of the trees and the thorns other than the shorts. On Uganda gorilla tours the light rain coat is also needed to help tourists in case of rain and coldness to those tourists not used to the coldness in these forests. The big hats are needed to cover you up during the sunny weather that you may not be used to. The cotton gloves are also needed to save your pretty fingers from getting scratched. The sun glasses are also needed to cover your eyes when there is sunshine. 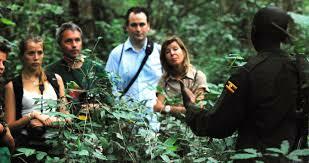 The hiking boots are also needed so as to hike the forests while tracking the gorillas. These are used during the rainy season where the areas are slippery therefore one needs stability to track the gorillas. If not the boots then the canvas shoes are used while trekking gorillas. Put on smartly like that and you will enjoy your Uganda gorilla tracking safaris and also tell others in your country to come and try out the experience. This will therefore increase more safaris in Uganda hence improving the tourism sector in Uganda. error: Content is protected by Prime Safaris & Tours Ltd ! !